Home » Christian living » What is the foundation of your faith? Jesus came to start a new religion, and the Apostle Paul was given a special revelation of grace so the Gentiles could be saved for the first time. The Holy Spirit fell for the first time in Acts 2, and no one had the Holy Spirit in them in the Old Testament. In the Old Testament, there was no grace only law so no one could be saved or become a child of God until Jesus had died on the cross. You believe it is impossible for you to obey the law of Moses, and the Mosaic law is a burden Jesus came to free us from. Now you are living by the law of life in Christ Jesus, not the Old Testament laws. You believe a gentile Christian does not have to obey by the law of Moses, you only have to obey by the moral code of the Mosaic law, but some of you believe it is ok for a Jewish Christian to keep all of the law as a part of their culture. So you have accepted Jesus as your Lord and Savior because you believe your faith in His obedience and His sacrifice makes you righteous and “saved” by grace through faith. Where in the Bible do you find these doctrines? If you can’t find these doctrines in the Bible, you have to ask the question where these doctrines originated from? The Bible or man’s interpretation of the Bible? If we can not find it in the Bible, we know it is only man’s opinions and man’s interpretation of the Bible. Yeshua warned us in Matthew 12:50 not to obey man’s interpretation and opinions as laws. He says if we do not heed His warning we become legalistic children of the devil and have fallen from grace. (John 8:44-45, James 2:10-26). Should you, on the other hand, find these doctrines in the Bible you know you have built your faith on a sure foundation. So we owe it to ourselves to make sure our faith is built on something we can find in the Bible. Only if we know for sure it is in the Bible we know for sure our faith is secure and founded on truth. If we can’t find it in the Bible, we owe it to ourselves to learn where it comes from and who it was that created these doctrines and what motives they had. Even though it sounds good, it sounds biblical; we must make sure we dont build our faith on doctrines formed by men like Jim Jones or Charles Ruzzle. So we owe it to ourselves to search our Bibles to make sure because if we dont do this, we could unknowingly have joined in with the sins of evil men such as Jim Jones, Charles Ruzzle and other cultic leaders. We see in the Old Testament several examples of how Yehovah judged Israel for unknowingly accepting doctrines and dogmas formed in the minds of evil men. So it is very important to know the Bible, so we can expose false doctrine and have our faiths built surely on Biblical truth. To be able to understand where these mainstream doctrines originate from you have to know church history and how the Christian church came to be what it is today. Constantine the Great reigned as a Roman emperor from 306-377 AD. Before he came to power, Christians in the Roman empire were persecuted and suffered greatly. We are not sure how Constantine became a Christian, it could have been his mother Helena who convinced him or he could have been the one who convinced her. In the year 312, he converted to Christianity, and the following year he issued the Edict of Milan decriminalizing Christian worship. Now Christians and people of all religions could live without fear of being persecuted because now they had the protection of the Roman emperor. Imagine what would have happened if Kim-Jong Un in Nort Korea suddenly declared he was a born again Christian and decriminalized Christian worship? This how it felt for the Christians in the Roman empire at the time when their Kim-Jong Un, Constantine the Great, suddenly declared he was a Christian and decided to decriminalized all Christian worship. Kim-Jong Un is responsible for inflicting much suffering and death upon our Christian brothers and sisters in North Korea. If he suddenly turned around and declared himself a Christian, we would say its a miracle, but we would also understand how the apostles felt when they heard Saul had met Jesus on the road to Damascus. How can you know for sure someone who is responsible for inflicting so much evil can be trusted? We have all seen examples on how politicians in our days claim to be a Christian to get support from Christian voters. The Bible says we can know for sure if someone is a genuine Christian not by what they claim to believe in, but by what they do. Our faith is supposed to be seen in the decisions we make and how we choose to live our lives. (James 2:10-26). So we know that the first Christians must have been skeptical to Constantines claims because they wanted to see proof of his conversion before they believed him. But as we are about to see, Constantine’s conversion turned out to be false and only a political ploy used to achieve peace in His Kingdom. What would your reaction be if someone you knew suddenly came and told you “I am saved, I am born again!”? As we have just seen, the Bible tells you to check for evidence of their confession. In Gal 5:22-23 and James 2:10-26 it says if it is genuine salvation, they will have a deep love for the word of God (the Bible) and a desire to obey the Torah (the law of Moses). If there is no desire to obey the law of Moses, and no respect for the Bible, that person is not saved. If that same individual started mixing a little bit of Bible with a little bit of new age and some portions of Islam starting their cult and labeling it as a Christian denomination, you would know they were not saved and deceived. You would also warn others against him or her because you would see how they had the potential of deceiving others making them believe their false version of Christianity was the correct one. This is what happened with cultic leaders such as Jim Jones, Jehovah Witnesses, the Mormons and with Constantine the Great. He had the potential of becoming the first Christian Roman emperor, but instead, he ended up mixing a little bit of Bible with a little bit of other pagan religions. If he had been alive today, we would have called him a cult leader and warned others against him. Instead, he became the leader of the Christian church in the Roman empire and was given the authority to decide Christian doctrine. How can you trust the Catholic church and the Christian denominations who share their theology when you know a cult leader, and a mad man decided their doctrines and how to interpret the Bible? In the year 313, the year after he had professed to be a Christian, Constantine the great issued what is called the Edict of Milan. The Edict of Milan removed penalties for professing Christianity, and it returned confiscated church property. The edict did not only protect Christianity, but it also granted religious freedom to all religions allowing anyone to worship whatever deity they chose. In the year 315, he built a triumphal arch to celebrate his victory in Battle of the Milvian bridge. Professing to be a Christian emperor we should expect him to decorate the arch with Christian symbolism so Jesus would be glorified and honored for giving him victory in the Battle of the Milvian bridge. If a Christian emperor chose to glorify other deities for his victory in battle we know for sure that man or that woman is not a true Christian. Idol worship is a sin (1.Cor 6:9) and giving glory and honor to pagan deities is idol worship. He decorated the arch with the image of the pagan goddess Victoria and when the arch was dedicated, he sacrificed to the pagan gods Apollo, Diana, and Hercules. This is the same man who later became the leader of the Christian church in the Roman empire. How would you react if you had a friend who claimed to be a Christian but gave glory and honor to pagan gods for something great that had happened in their life? James 2:10-26, 1.John 2:6 says that if a person believes in the cross, their faith will show itself in obedience to the law of Moses. The law of Moses forbids any idol worship, so if a person confesses faith in the cross and continues with idol worship, he or she is not saved according to James 2:10-26. This is why we know for sure Constantine the Great was not a Christian emperor and his claims to faith were not true. We know the Bible is all about the Jewish God Yehovah, the God of Abraham, Isaac, and Jacob. Its all about Yehovah’s relation to His people, the Jews and how He first divorces Himself from them but then comes as Yeshua to free them from the law of jealousy in Numbers 5. As it has always been in the Bible, everyone can join His people the Jews, regardless of their ancestry or DNA, if they want to repent from their sins and obey the Torah and be reconciled to God by believing Yeshua died for their sins. (Isaiah 56:3, Rom 2:29, John 1:12, 3:16, Matt 15:24) This is what the Bible says, but as we are about to see, Constantine the Great made every effort of removing the Jewishness of the Bible in his attempts to mix a little Bible with some worship of pagan gods. In the Bible, in Ex 31:17 the Shabbat is described as an eternal sign between Yehovah and His people. We know Yeshua kept Shabbat and we know the Bible says in 1. John 2:6 if we claim to be united with Yeshua we have to do what He did. If He kept Shabbat, we have to keep Shabbat if we want to be united with Him. Because Shabbat is a requirement in the law of Moses our obedience to it will be an outward sign showing to everyone everywhere we have living active saving faith in the cross. Considering also how the Shabbat commandment is one of the ten commandments, it is obvious it is a big deal to Yehovah and important for us to obey it. In the year 321, Constantine the Great decided that the Shabbat would be changed from Saturday to Sunday. Ever since then Christians all over the world have decided to rest on Sunday instead of the Biblical Saturday. So even though the Bible says we have to celebrate the Shabbat if we want to have an active living saving faith in Christ, Constantine the Great took it upon himself to change this and decide that from now on Shabbat would be held on Sunday instead of Saturday. If Constantine never repented from his sins, he is now in hell being tormented under the wrath of Yehovah. Why would you want to join him? The Bible says in Matthew 7:21-23 if you obey man’s laws and label them as “Christian” you are living in sin, and you are guilty of being lawless. When you obey Constantine and celebrate Shabbat on a Sunday instead of Saturday as the Bible commands us to, you are being lawless and living in sin. You can claim to believe in Christ all that you want, but if you are living lawless, the Bible says Christ does not know who you are. (Matthew 12:50, 7:21-23, 1.John 2:6). If you are still in doubt when it comes to the Shabbat, consider how Constantine was not a Christian because we know he allowed sacrifices to pagan gods in the year 315. The Bible says Shabbat is from Friday sundown to Saturday at sundown, Constantine the Great says it starts on a Sunday when the sun rises. Who should you listen to? Yehovah your God, the God of Abraham, Isaac, and Jacob who died on a cross to save you and commanded you to keep Shabbat from Friday-Saturday? A human being who sacrificed to pagan gods and decided to change the Shabbat from Saturday to Sunday? In the year 325, Constantine the Great summoned the church to the first council of Nicea. The purpose of the council was to achieve unity in the church and resolve doctrinal differences. Up until the council of Nicea Christians were used to celebrate Passover and not Easter. The Bible even commands us in the law of Moses to celebrate Pesach (Passover) among one of the many feast days of Yehovah. At the council of Nicea, it was decided that all Christians should from now on celebrating Easter instead. You might ask what is the difference and why is this important? Passover (Pesach) is a commandment found in Exodus 12. Yehovah commands us to celebrate it as a memorial for what Yehovah did for us in Egypt when He told us to smear the lamb’s blood on our doorways so the destroyer would pass us over. We can’t find any commandment in the Bible telling us to celebrate Easter or telling us to celebrate Yeshua’s resurrection. Yehovah told us to celebrate Passover on a fixed day the 14th day on the first month of the Hebrew calendar. Constantine the great decided in the year 325 AD easter should be kept on the first Sunday after the first full moon occurring on or after the first vernal equinox. Passover in Exodus 12 points forward to what happened on the cross when the lamb of God who takes away the sins of the world would die, and His Blood would become available to all who will believe and repent (John 1:29). Yeshua always kept the Passover, so the Bible says in 1.John 2:6, James 2:10-26 we have to keep the Passover to be saved and united with Him. On His last Passover, Yeshua instituted unleavened bread and wine as new symbols representing His broken body and Blood. He told us to do this on Passover in remembrance of Him (Luke 22:19). In 1. Cor 11:23 the Apostle Paul repeats this commandment when he tells us to celebrate communion on the Jewish feast of Passover, in remembrance of the cross. Just as with the Shabbat it is extremely important to Yehovah that we celebrate His feasts on His feasts days following His calendar. In the New Testament, we learn it is extremely important to celebrate communion on Passover to remember and focus on what happened on the cross. This is what the Bible says, but in the year 325 AD Constantine the Great decides all Christians should start celebrating Easter instead of Passover. He also decided that all Christians should stop immediately celebrating the Lords Feasts and instead follow the Julian Calendar which centered around the sun. Stop for a moment and consider what Constantine did. He took the Bible and all of Yehovah’s laws and changed them, and from then on most of Christianity has obeyed him instead of obeying Yehovah. Constantine was a mortal, sinful human being who rebelled against his maker. Every time you celebrate Shabbat on a Sunday or you celebrate Easter; you are obeying Constantine and not Yehovah when you read Matthew 12:50, 7:21-23 and 1.John 2:6 you will soon see you have good reason to worry about where you will spend eternity. Not all Christians obeyed the council of Nicea; there were still some who believed they should follow and obey the Bible, so they continued to celebrate the Lord’s feasts. Constantine the Great unleashed heavy persecution against them, declaring them to be Judaizers. This is identical to what people like Jim Jones did if you did not agree with his “version” of “Christianity” he persecuted you until you decided to obey him. The term Judaizer is often used in today’s mainstream Christianity if someone believes what the Bible says in James 2:10-26, Matthew 12:50, 7:21-23, 1.John 2:6. If you are one of those who is quick to label someone as a Judaizer you should know the emperor of Rome would applaud you, but Yehovah your God would get offended at you. You dont want to offend Yehovah your God; He is the one who has the authority to throw you into the lake of fire when you die. So who should you listen to? The man Constantine the Great or the God of Abraham, Isaac, and Jacob whose name is Yehovah and gave us Himself to die on a cross for our sins? If Constantine did not repent before he died, he is now in hell being tormented for all eternity by Yehovah, suffering under His wrath. Why would you want to join him just because it is “tradition” to celebrate Easter and have your Shabbat on a Sunday? Why then do you each Sunday, and each Easter obey the cult of Constantine the Great? Why did Constantine decide that all Christians should stop celebrating Passover and instead celebrate easter? Yeshua answers this question for us in John 4:22 when He says salvation is from the Jews. The spirit that was in Constantine the Great is the same spirit that tempted Yeshua in the desert, and through the willing vessel of Constantine, he was able to lead many people astray who have now ended up in hell. These people lived their lives as Christian, believing they were saved, but they never kept Torah, so one day they heard Yeshua say “depart from Me for I never knew you, your workers of lawlessness.” (Matt 7:21-23). Constantine the Great has been dead for many centuries now, but as we will see later, the spirit that was in him has been very active in other famous theologians. So let us for a moment look in the Bible and see what it has to say about Easter, the Shabbat and how we are supposed to live. If you have a Bible, you can read the Gospels and how they describe the life of our Lord Yeshua. There is no doubt that He was born a Jew and lived as a Jew obeying every commandment in the law of Moses that applied to Him as a Jewish man. If He had not done this, He would have sinned, and if He had sinned, He could not have been Gods lamb that took away the sins of the world. So for Him to be Gods lamb who takes away the sins of this world, He had to obey the law perfectly. Most Christians regardless of how they view the Torah and their denominational background would agree on this one thing: Yeshua never sinned and lived His life as a law-abiding Jew. So if you have Bible at hand, you can check all of this for yourself, and you will see how it says Yeshua was a Jew who obeyed the law of Moses (the Torah) and taught everyone who believes in Him to do the same thing. We also know that the death of Yeshua was a good thing, He had to die on that cross to free us from the law of death in Numbers 5. If He had not died, we could never come back to Yehovah; we would be eternally lost because it is an abomination for Yehovah to accept us back as His people just on account of our obedience. He divorced us because of our disobedience, and only His death and our death by faith can free us from the law in Numbers 5 hindering us from coming back to Him. Nowhere in the Bible does it say that Yeshua was murdered by the Jews and Christians everywhere today celebrate the fact that He died on the cross for our sins. He died because He wanted to die on the cross (John 3:16) not because someone murdered Him. But as we are going to see, the spirit that was active in Constantine did not agree with this. So why did Constantine decide Christians should celebrate Easter instead of Passover? “It was, in the first place, declared improper to follow the custom of the Jews in the celebration of this holy festival, because, their hands having been stained with crime, the minds of these wretched men are necessarily blinded. … Let us, then, have nothing in common with the Jews, who are our adversaries. … Let us … studiously avoiding all contact with that evil way. … For how can they entertain right views on any point which, after having compassed the death of the Lord, being out of their minds, are guided not by sound reason, but by an unrestrained passion, wherever their innate madness carries them. … lest your pure minds should appear to share in the customs of a people so utterly depraved. … Therefore, this irregularity must be corrected, so that we may no more have anything in common with those parricides and the murderers of our Lord..no single point in common with the perjury of the Jews”. So the reason for deciding that all Christians from now on should stop celebrating Passover, and instead celebrate Easter, was that he believed the Jews had murdered Yeshua and that Yeshua had given the Christians a better way. What he says in these two letters contradicts what the Bible teaches, the Bible teaches that Yeshua kept Passover, it says that Paul kept Passover and Yeshua, Paul, John the Apostle and Jacob the Apostle all told their readers to imitate the life of Yeshua to be united with Him. How can you imitate His life if you celebrated Easter when Yeshua celebrated Passover? We also know from the Bible the Jews did not murder Yeshua. He died because He wanted to die (John 3:16) so that all who believes He died for them could be set free from the law of sin and death in Numbers 5 keeping us prisoners and eternally separated from Yehovah. Constantine the Great believed it to be a crime and a defeat that Yeshua died on the cross, but the bible says if you dont accept what He did for you at the cross, you are not saved. So it was obvious Constantine the Great was not born again. What has all of this got to do with us today? Constantine the Great died a long time ago, and very few of us belong to the Catholic church who still teaches most of these lies as truth. But even today we have preachers such as Kenneth Copeland and others who claim that the cross of Christ was a defeat. So there are still preachers today and denominations who unknowingly follow the cult of Constantine instead of the Bible and Yeshua. We know the Bible says the cross of Christ is our only source of victory, without it we are all eternally lost. So even though Constantine would applaud preachers like Kenneth Copeland, the Bible would disagree with both of them. The majority of mainstream Christianity believes the Torah (the law of Moses) was just for the Jews because we who are Christians are under grace and not law. So only the moral commandments of the Torah applies to us. We know the Bible says if you want to be saved, your faith in the cross has to show itself in total devotion and obedience to the law of Moses (the Torah). You have to make it your priority to imitate the life of Yeshua the way Paul the Apostle, John the Apostle, Jakob the Apostle, James the Apostle imitated His life. So if He kept the Lord’s feasts days, we have to keep the Lord’s feasts days such as Passover, Sukkot. If He kept Shabbat from Friday-Saturday, we have to keep Shabbat from Friday-Saturday. So it is very obvious the spirit that was once in Constantine the Great is very active in the church today. Constantine the Great was never saved, if he had been alive today, we would have called him a cult leader and avoided him and his teachings like the plague. We would have considered him to be the same type of crazy individual as Jim Jones or Charles Taze Russell who founded the Jehovah’s Witnesses. Even though Constantine is long gone and has been dead and buried for centuries, his spirit is still well alive in the church considering how most of mainstream Christianity still repeats and teaches his lies as Biblical truth. Would you obey and believe in the teachings of Jim Jones and Charles Taze Ruzzel? I hope your answer is a loud resounding no, but the question then poses itself, why would you obey and believe in the teachings of Constantine the Great? Why would you obey a mortal human being who right now could be in hell, being tormented for all eternity under the wrath of Yehovah when you can obey Yeshua who is Yehovah? But what about the great reformer Martin Luther? Surely he must have seen how evil the Catholic church was and how it was influenced by the lies of Constantine the Great? As we are about to see, the spirit that was once active in Constantine continued its work through Martin Luther. Martin Luther was born November 10, 1483, in Germany and was ordained as a priest in the Catholic church in 1507. He soon saw how practices and beliefs in his church did not line up with what he read in the Bible, so in 1517 he disputed the Catholic churches practices of indulgence teaching that salvation and eternal life are not earned by doing good deeds. He believed they are instead Gods gifts as a result of the believer’s faith in Jesus Christ as redeemer from sin. He taught that the Bible is the only source of divine knowledge, this challenged the authority and office of the pope. He also considered all baptized Christians to be a holy priesthood, something which challenged the Catholic teaching on sacerdotalism. He became very unpopular, and his attempts of reforming the Catholic church had failed by the year 1521, and he was excommunicated by Pope Leo X and the Roman emperor Charles V. When this happened Luther left the Catholic church and formed what we know today as the Lutheran church. Martin Luther is the great hero of Christianity, the one who rediscovered salvation by grace through faith alone and fought the unbiblical Catholic church. We can all agree on most of his teachings; the Bible does teach that salvation is Gods gift as a result of believers faith in Jesus Christ as a redeemer from sin. And we can all agree the Bible is the only source of divine knowledge. But if you get the cross of Christ wrong you get the entire Bible wrong, and as we are about to see, both Constantine and Luther hated the Jews so much they were unable to understand the cross. The Bible is a Jewish book all about the God of Abraham, Isaac, and Jacob whose name is Yehovah. It is all about Yeshua coming to earth to live as a Jew, teaching His disciples how to properly obey the Torah and then dying on a cross to free us from the law of jealousy in Numbers 5. It is all about salvation that comes from the Jews (John 4:22) if you hate the Jews and everything Jewish, you can not understand the cross and salvation. If you get the cross wrong, you get the Bible wrong, and you end up mixing the Bible with your own ideas. This is exactly what happened to Martin Luther just as it had happened centuries before with Constantine the Great. We remember how Constantine the Great believed the Jews had murdered Yeshua, and for this reason, they were rejected by God. We know the Bible says Yehovah has never rejected Israel (Romans 11) Luther shared Constantine’s belief that the Jews had murdered Yeshua and for this reason, they were rejected by God. If you believe the Jews murdered Yeshua you believe He died an accidental death and not a planned one. The Bible says His death was permitted and allowed by Yehovah (John 3:16) to free us from the law of sin and death in Numbers 5 (Gal 3:13). If you believe He was murdered, you will end up getting the cross wrong, if you get the cross and salvation wrong you get the entire Bible wrong. And as we will see, both Luther, Constantine and plenty of preachers today believe this lie that says He was murdered by the Jews. How can you believe He died for your sins if you believe His death was an accident because the Jews murdered Him? If He was murdered He is no longer Yehovahs gift to you, if He is no longer Yehovahs gift to you (John 3:16) you are no longer able to be reconciled to Yehovah. We know the Bible says Yeshua died because He wanted to reconcile us to Him. So nobody murdered Him, He gave His life so we could live. The only way that could happen was through His death on the cross, and we were united with His death by faith, so we could both be free from the law in Numbers 5. So we know the Bible clearly says, the cross and the death of Yeshua was and is the greatest event in human history. If it had not happened, we would all be eternally lost. We also know the Bible says in Romans 11 Israel and the Jews have never been rejected by God. So when both Constantine and Luther believes the Jews and Israel were rejected by God for the murder of Yeshua, they dont know the Bible. They take a little bit of Bible, mix it in with their interpretations. What they end up with, and what we call Christianity, has nothing to do with the Bible and true Christianity. There is no difference between Christianity as we know it and Phariseeism when Yeshua walked the earth. Both made Yehovah’s laws to no effect by elevating their own traditions and doctrines and demanding obedience to men, instead of obedience to God. What Martin Luther and Constantine did is exactly what Jim Jones and Charles Ruzzel did. They were all guilty of taking a little bit of Bible and mixing it with their own ideas. This is what made them dangerous cult leaders, and nobody in their right mind would accept their views on the Bible. Constantine the Great and Martin Luther did the same thing, but we treat them as great heroes in the church and read books and Bible commentaries they have written allowing them to influence us in how we read and understand our Bible. Why would you reject Jim Jones and Charles Ruzzel but accept Constantine the Great and Martin Luther? They were all unbiblical cult leaders who led people astray. Perhaps you dont believe He was murdered by the Jews, but you share some of Martin Luther’s believes that is biblical and true. Jim Jones and Charles Ruzzel also had some biblical truth to what they said, but you would never even entertain the thoughts of accepting what they taught because we know them as cultic dangerous sect leaders. We know from the garden of Eden this is how the devil operates, he takes some truth and mixes it with some lies. Be careful not to repeat Adam and Eves mistake (Matt 7:21-23). If you believe the greatest gift was ever given to mankind, the cross of Christ, was a defeat or a murder you have never really understood the Bible and opened yourself up to living lawless just as Adam and Eve did. We see this in the Bible in 1.John 2:6, 3:4, 3:7, 5:3 where it says anyone who believes Yeshua died for their sins has to live their lives the way He lived His life. There is no doubt He was a Jew, and the Apostles were all Jews. So what the Bible teaches us is that if we want to be saved, we have to believe He died for our sins and showed Him that we believe by making it our priority to obey the Torah (the law of Moses). When Martin Luther wrote the essay in 1523, he expects that all Jews who come to faith in Christ has to change their identity and go from being a Jew to become a Christian. He believed this because he shared Constantine’s faith in the lie that says the Jews had murdered Yeshua and they were rejected by God because of it. Luther shares the faith of Constantine that a good Christian makes a clean break with everything Jewish such as food laws, Shabbat and the feast days. In his mind, and the mind of Constantine, Yehovah hated everything Jewish because the Jews had murdered Yehovah’s son. We know the Bible says the Jews did not murder Yeshua, He died because Yehovah wanted it as a gift to all of us so we could live and have eternal life. So we see that even though Luther shows some respect for the Jews in the essay of 1523 he has not understood 1. John 2.6, 3:4, 3:7, 5:3 and what it means actually to believe in Christ. The Bible says if you believe in Christ and what He did for you, you will begin to live as a Jew (Rom 2:29, James 2:10-26). In this essay he tells the Christians to avenge the innocent blood of Yeshua by setting Jewish synagogues and schools on fire, destroying Jewish prayer books, burn Jewish homes, confiscate Jewish money and property, forbid Rabbis to preach, gather the Jews into forced labour camps (concentration camps), expel them from every nation on the earth and even take their lives. In 1546 he argued in a sermon that Jews must receive Christ and abandon everything Jewish and especially the law of Moses which Luther regards as filth and something the devil has made. He says in this sermon that if a Jew converts and becomes a Christian, he is to be treated as a Christian brother or sister. If he refuses to convert, Luther argues it is best to take their lives. From the essay in 1543 we see how Luther understood the cross, he believes Christians should avenge the innocent blood of Yeshua. But why should we avenge the innocent blood of Yeshua, when we know the Bible says it was and still is Gods gift to all those who will believe in the cross and repent back to Torah obedience? It is very obvious Luther, Constantine got the cross wrong, and if you get the cross wrong, you get Yeshua wrong. If you get Yeshua wrong, you end up becoming one of many religions that mention the name Jesus and believes in a Jesus, but He is not the Yeshua of the Bible. There is only one Yeshua of the Bible, and He died on the cross as a gift to all who will believe and repent back to Torah obedience. Nobody in their right minds would accept Christian theology and doctrine born in the minds of a Nazi priest or Nazi clergy. When you read the writing of Martin Luther, you quickly come to realize there is no difference between his faith and what Hitler believed in. They both saw it as their mission in life to demonize the Jews, and we know as a historical fact that Luther’s views on the Jews were highly celebrated and held in high regard in the Nazi party in Germany. It is highly possible that Hitlers “final solution” was inspired by Martin Luther’s essays where he encouraged Christians to avenge the innocent blood of Yeshua by killing Jews who would not convert to Christianity. So where did Luther get his ideas from? The first one we know who shared Luther’s and Constantine’s view on the Jews would be Haman the Agagite in the book of Esther in the Bible. Haman the Agagite hated the Jews, but Esther stepped in and saved them from being exterminated. The Bible says in Eph 6:12 we do not war against flesh and blood, but we war against spiritual powers. The same spirit that was in Haman we find in Constantine the head of the Roman church and later on in Martin Luther. Why does this spirit hate the Jews so much? The Bible has an answer for this in John 4:22 where it says salvation comes from the Jews. This spirit that was in Haman, in Constantine and Martin Luther knows that for a person to be saved two things has to happen. He or she has to believe Yeshua died on the cross, and their faith in the cross has to show itself in obedience to the Torah and the law of Moses. James 2:10-26, 1.John 2:6 says if there is no evidence of obedience to the law of Moses that person is not saved. We see this in Matthew 7:21-23 where many Christians who belive Jesus died for them on the cross, but their faith has never been seen in obedience to the law of Moses, will one day hear “depart from Me for I never knew you, your workers of lawlessness”. If you believe Jesus died for your sins, but you believe as a Gentile you dont have to obey the Torah and only the moral code of the Torah, that spirit who was in Haman, Constantine and Luther has achieved its goal. You cant be saved if you only live morally clean but you still eat unclean foods, ignore the Shabbat and other commandments in the Torah that applies to us living outside Israel without access to a temple. We started this weeks sermon by asking the question, “where in the Bible do you find these doctrines”? The answer is, nowhere in the Bible. Then we asked the question if it is not found in the bible where do they come from? The answer is, they originate from the minds of Haman the Agatite, Constantine the Great and Martin Luther who all hated the Jews and everything Jewish. When you know that the Bible says salvation comes from the Jews, it should concern you when you hear your pastor or favorite evangelist telling you the law of Moses is evil and a burden. It should concern you when you hear your pastor or favorite evangelist telling you to tithe, but not to obey the law of Moses because that was done away with at the cross. It should concern you when you hear your pastor or favorite evangelist telling you it is ok to eat pork and every day is a Shabbat for Christians. Because what you are hearing is the spirit that was in Haman the Agatite, in Constantine the Great and Martin Luther. These three men are long since dead, and probably right now being tormented in hell under the wrath of Yehovah. But the spirit that was alive in them is still very active and alive in the church world of today trying to make people hate the Jews, or at least believe that as a Gentile they dont have to concern themselves with those things of the law of Moses that are “too Jewish”. The goal of that spirit is to deceive you into losing your salvation so you will be the one who hears “depart from Me, for I never knew you” when you die and leave this earth. Do not be deceived, read your Bibles for yourself and accept John 4:22 which says salvation comes from the Jews. Did Yeshua come to start a new religion called Christianity? No He came to reform Judaism by teaching us how to obey the written Torah and only the written Torah, and to reconcile us to Himself by dying on a cross, so we could be free from the law in Numbers 5. 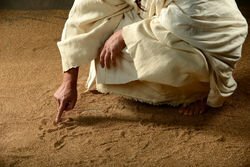 Was Yeshua murdered by the Jews? No He gave His life willingly on the cross so that you and I can live and have eternal life. Does Yeshua expect you to obey the law of Moses, now that you believe in Him? Today it is Shabbat, and the Shabbat will begin in a few hours from now when the sun sets. The Bible has nothing to say about worship on the Shabbat, so if you are in an area of the world where there are no congregations that meet on the Shabbat, you are free to worship on a Sunday. The only rule of the Shabbat is not to work for money, and dont make others work for money, so make sure to do your groceries today. There are of course exceptions to this, if you have a medical emergency you are allowed to break Shabbat and if you have a medical condition that makes certain things only possible to do during Shabbat, you are allowed to do them. But the rule of thumb is this, if it can wait until tomorrow when the sun sets it has to wait. I will return next week with another Shabbat sermon published 01:00 am CET (Central European Time). Keep sending me your prayer, prophecy and counseling requests during the weekend and week. It is free of charge, and I will respond as soon as possible.